By buying this product you can collect up to 2848 bonuspoints. TQi 2.4GHz (2-Channel) Intelligent Radio System TSM. Total Control. Traxxas models deserve the world's most advanced Ready-To-Race® radio system. The radio system is the sole connection between the driver and machine, and needs to be precise, comfortable, powerful, and reliable. 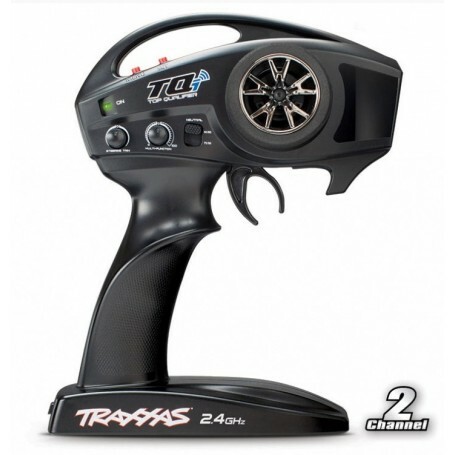 The Traxxas® TQi radio system boasts a full range of tuning features; long-range, 2-channel versatility, high-output, 2.4GHz signal, and proven Traxxas reliability for rock-solid performance. However, the most important and innovative feature may already be in your pocket. TQi can be equipped with the revolutionary Traxxas Link Wireless Module that turns your Android or Apple iOS device into a powerful tuning tool for your Traxxas model. The full-color display combines with the Traxxas Link App to deliver an intuitive, high-definition, full-color graphical user interface that unlocks the mysteries of optimizing your radio system for ultimate vehicle control. The Traxxas Link Wireless Module is compatible with Android 4.4+ or Apple iOS 4.3+ platforms (see device requirements). Traxxas Stability Management (TSM) allows you to experience all the extreme power, speed, and acceleration that was engineered into your XO-1 making it much easier to control on common slippery surfaces such as dusty asphalt, smooth concrete, and even ice and snow. Punch it off the line and TSM goes to work sensing the vehicles direction and making steering corrections to provide straight-ahead full-throttle acceleration without fishtailing, spinouts, and loss of control. TSM also works during cornering, first making intuitive corrections to maintain your line, and then allowing you to hammer the throttle earlier in the turn for much faster exit speeds. Braking is dramatically improved as TSM works to keep you arrow straight until you come to a complete stop. Automatically stores and loads settings for up to 30 Traxxas Link Model Memory enabled modelsjust switch on and drive, 'model selection' is not required.